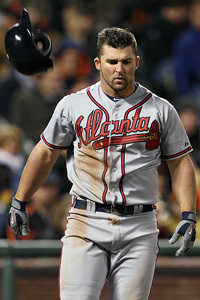 Seldom-hitting, tight-fitting Braves second baseman Dan Uggla certainly heard the Philadelphia crowd this weekend (in part due no doubt- I'll note these things- to his Saturday home run off CLIFTON PHIFER LEE). To his credit, he seemed particularly self-aware, though this quote's being claimed following the Phils eleventeen to one Sunday bloodletting might have added a little extra melon to his choly. seek not to alter me. carmageddon,acre,stephen kingMy partner and I absolutely love your blog and find almost all of your post's to be exactly I'm looking for. Would you offer guest writers to write content available for you? I wouldn't mind writing a post or elaborating on some of the subjects you write related to here. Again, awesome blog!